It’s a question Tony & I asked one another repeatedly and incredulously during our four days roadtripping and national park hopping through the state. Each time one of us asked it, the other would shrug and guiltily mumble the word “Mormons” before hastily pointing to the next jaw-droppingly gorgeous vista in a bid to change the subject and make up for so much wasted time. I like to think I’m a pretty open-minded person, but if I’m being totally honest, prior to planning our road trip down to Mexico, I never once considered visiting Utah during my seven-year stint living in the U.S. If you’re anything like me, you probably haven’t considered visiting it either, since the state’s close ties to Mormonism tends to overshadow nearly everything else. Before visiting Utah, the name alone conjured up images of suspiciously large families, extreme religious fundamentalism, and buttoned-up backwater cults that I admit came largely from the tv show Big Love and John Krakauer’s book chronicling the violent and destructive history of the Mormon faith, Under the Banner of Heaven. Now that I’ve visited, however, when I think of Utah, my heart flutters and my eyes get moony. 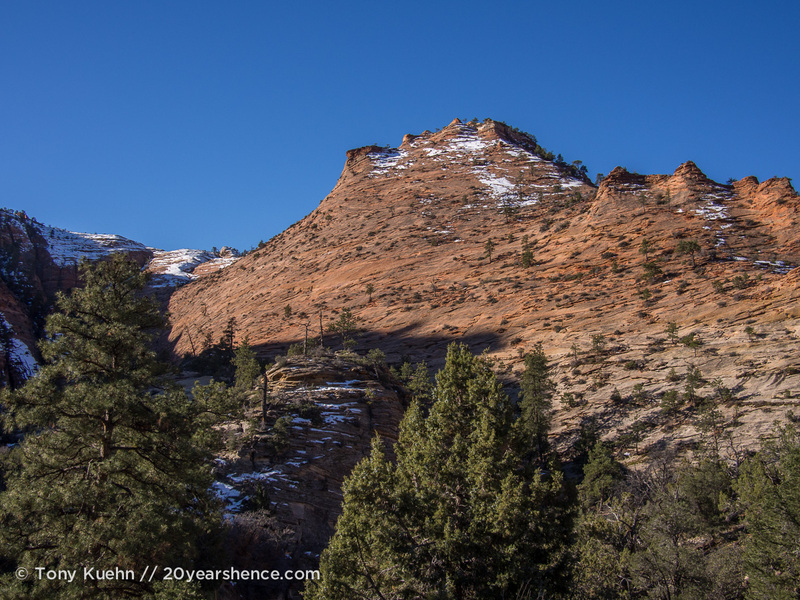 I think of prehistoric red rock canyons and fairyland hoodoos and majestic stone arches standing against a backdrop of icy blue skies and snow-capped mountains. I think of a place where the air is sweet and clean. I think of one of the prettiest places I have ever been. Despite all of its religious associations, the bulk of our time in Utah was surprisingly (blessedly? Ha!) secular. There were a few subtle influences here and there—driving through some small towns on Sunday, most business were shut up tight; beer prices in Moab were quite high; and the beehives on the state highways are a nod to the original name given to the state by Mormon settlers, Deseret, which is an ancient word meaning “honeybee” according to the Book of Mormon—but most of them would only ping your “Mormon radar” if you were actively looking for them. And, to be perfectly frank, if you’re spending your visit focusing on the Mormon slant, I’d argue that your priorities are messed up! We were so busy being flabbergasted by the scenery that it didn’t take very long for our prejudices to melt away. 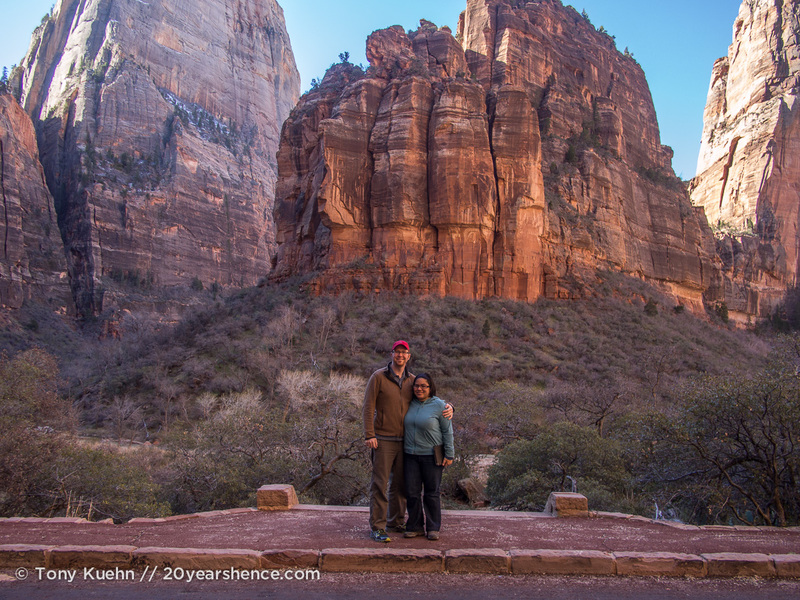 On our final day in Utah, we made our way to Zion National Park, and it was perhaps the perfect blend of what this state is really about: a showcase of its stunning scenery as well as our most overt exposure to its religious ties. 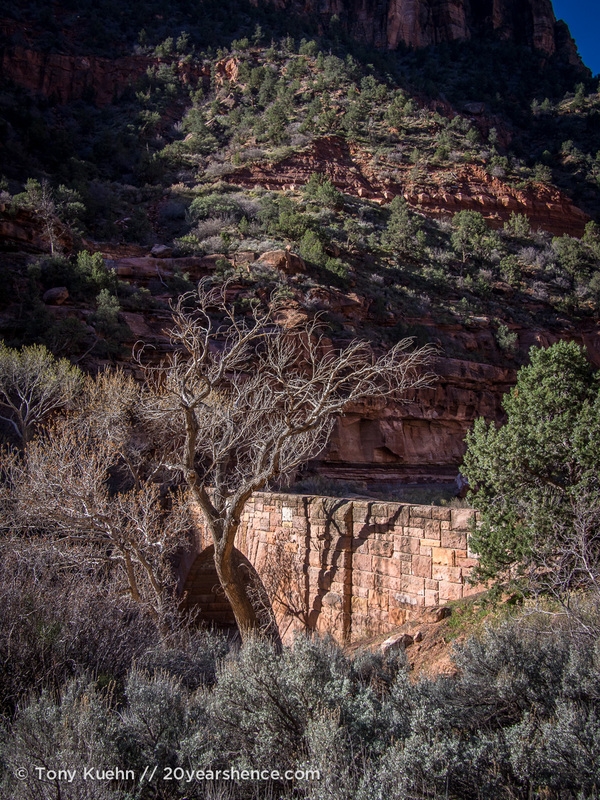 When Mormon farmers first settled here in the mid 1800s, they named the area Kolob after the heavenly place in their scripture that is the nearest earthly abode of God; though the park was renamed Zion (itself a reference to a place of peace in both the Bible and the Book of Mormon) when it was established as a National Park by the United Sates government in 1919, to this day, a northwestern section of the park is still named Kolob Canyons and one of the most famous geological formations in the park is termed “The Court of the Patriarchs”, a trio of sandstone peaks each named after figures from the old testament: Abraham, Isaac, and Jacob. Mount Moroni (the name of an angel from the Book of Mormon) also sits amongst them. 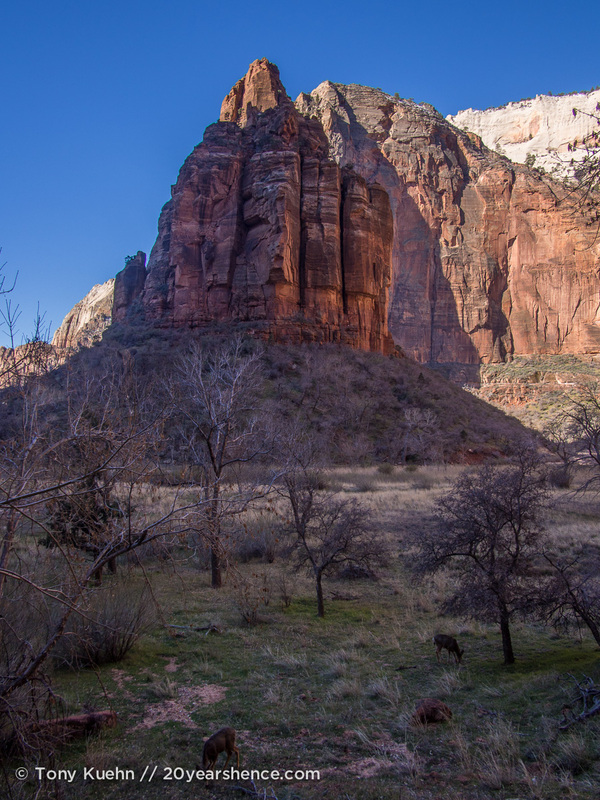 We saw these peaks as we drove through Zion Canyon (during the winter season, traffic is light enough that they allow private vehicles through the canyon, a boon to us as it meant the dogs were able to enjoy the sights alongside us), gazing up at them in wonder and trying our best to capture their grand majesty with our tiny cameras. 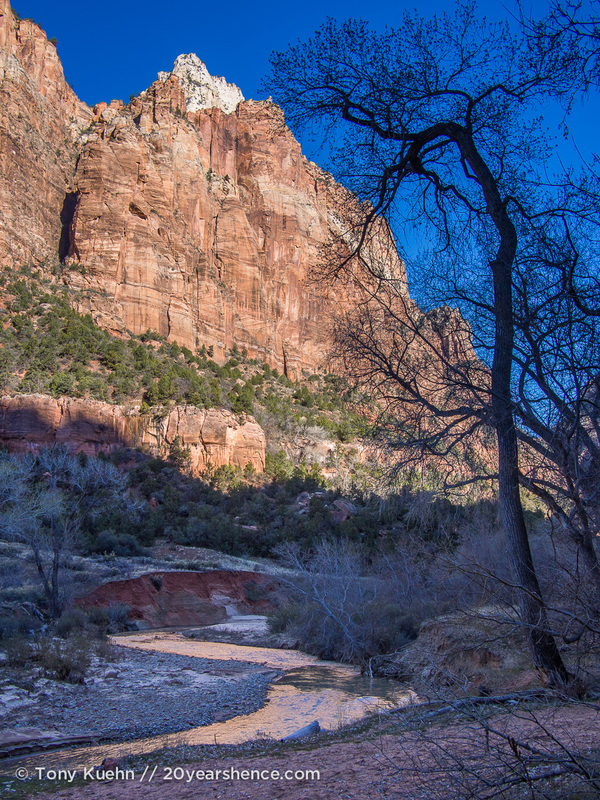 But truly, Zion is not one of those places even the loveliest of photos can truly do justice to. It’s so big and sweeping, from its rocks to its rivers, that a picture will only ever capture a speck of that. 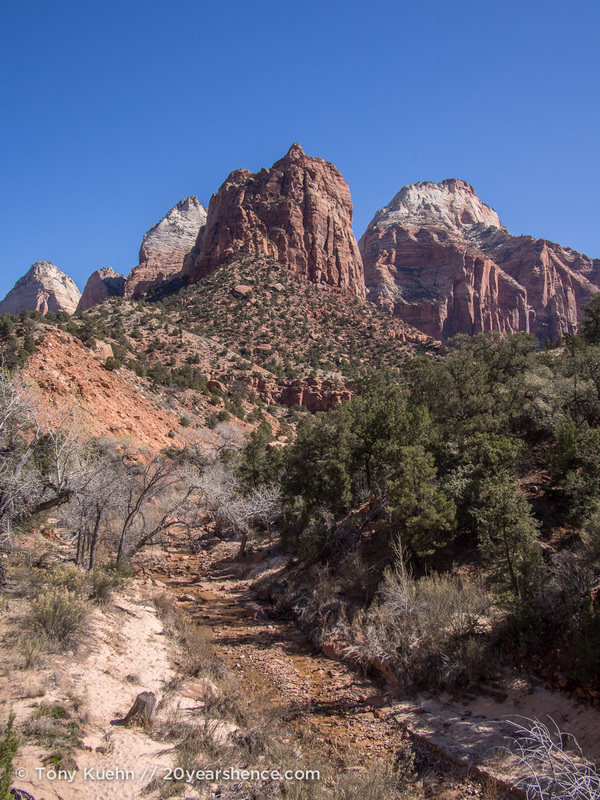 Zion is a hiker’s paradise and it’s generally accepted that the best way to experience and appreciate the park is by tackling some of its trails. Alas, only one path is dog-friendly and all the others required a time investment that we didn’t feel comfortable with as they would require leaving the dogs alone in the car for hours—something we simply weren’t comfortable doing. 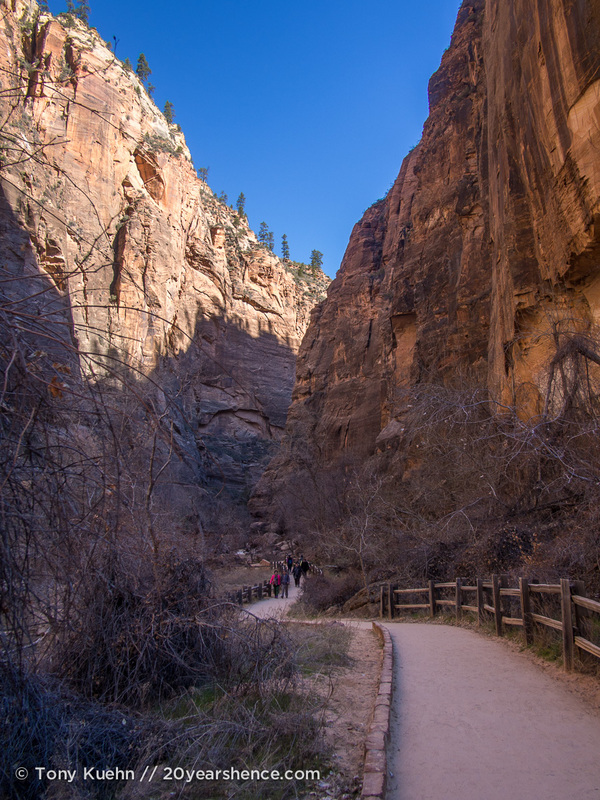 Moreover, many of the hikes at Zion are quite challenging and are doubly so in the winter when ice and wet rock result in slippery surfaces, so many of the trails were still closed for the season. 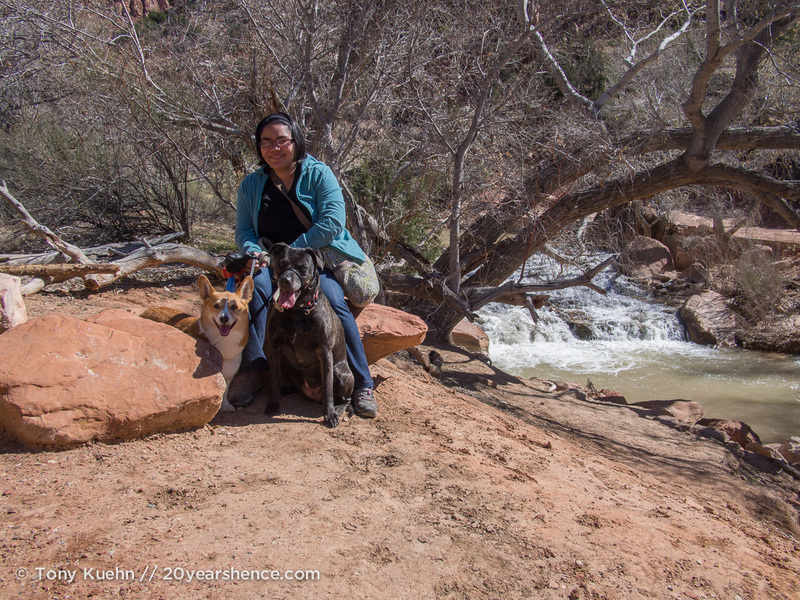 Maybe one day we’ll return and tackle some of the more famous trails, but on this go around, we were happy to do a portion of the riverside walk along the Virgin River at the end of the canyon, and then took the pups for a lunchtime stroll down the Pa’rus trail. Here, walking this trail, we learned firsthand—much like the Mormon farmers before us —just how harsh and inhospitable the land in this area can be: Although they had to contend with poor soil and little arable land as well as flash floods, we had high temperatures and prickly cactus thorns to pluck from tender puppy paws to deal with. 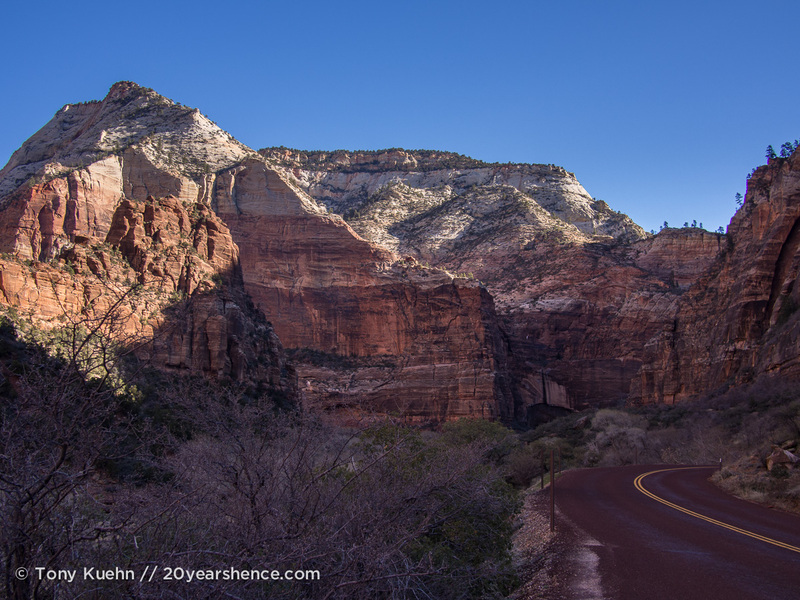 For a place named for peace, Zion is clearly a harsh, yet beautiful, mistress. Now it’s your turn! Tell Us: Have you ever visited Utah? If so, what did you think of it? If not, what’s been holding you back? 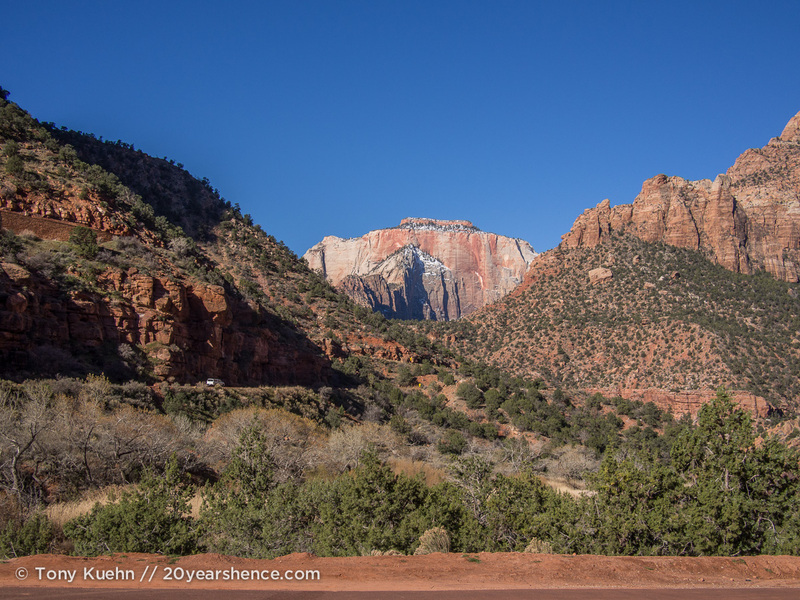 Have our photos of Zion changed your mind? I am aware of the Mormon background of Utah but it hasn’t deterred me wanting to visit, I want to experience the incredible National Parks there. 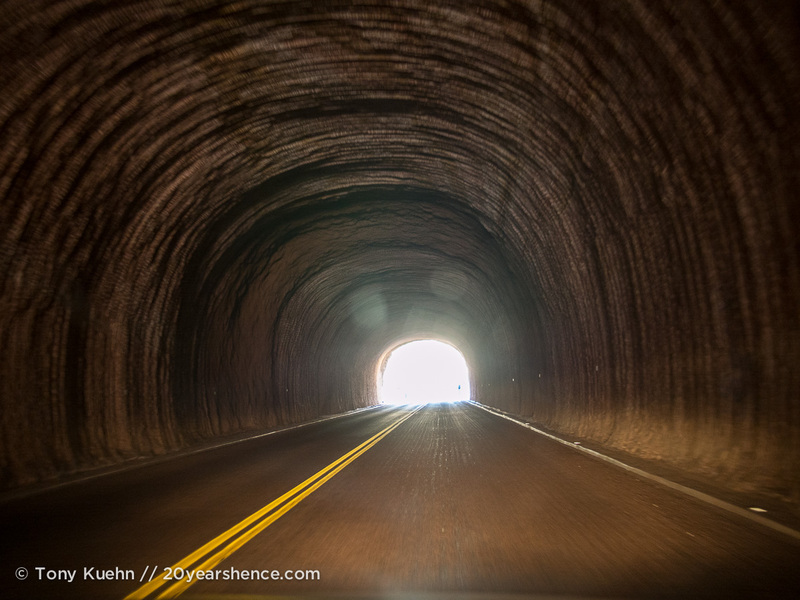 I have been to Monument Valley in Utah but that is it so far – I definitely need to get to Zion NP! 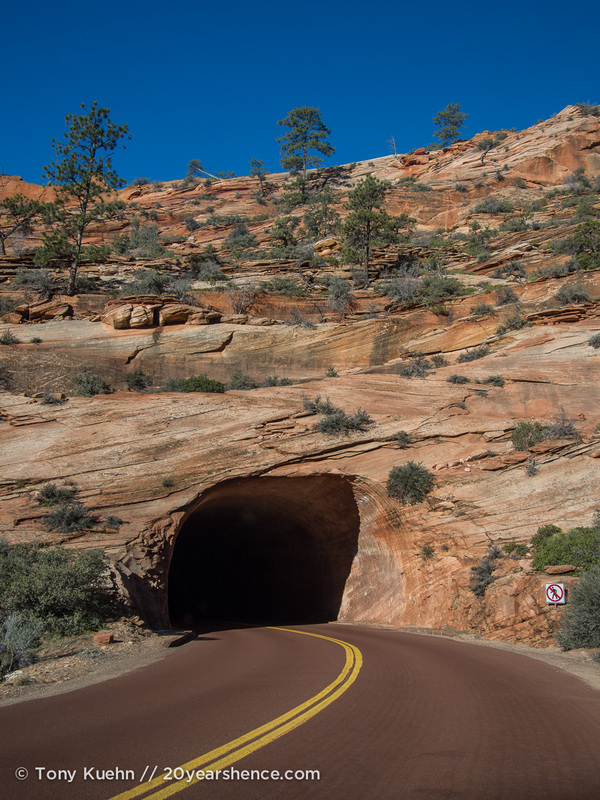 There are so many incredible things to see and do in Utah! Looking back, I can’t believe we *only* spent 4 days there and managed to do all that we did… but we still missed out on several things I’d love to do on a return visit (like Monument Valley!). The national parks there are really just spectacular, so I hope you get to revisit the state and check some of them out! Yeah, Zion was definitely a very special place, and there is something about its scale and beauty that makes you ponder your place on this planet. Even after traveling to some pretty special places over the course of the last 2.5 years, Utah just really blew me away. I can’t wait to return! I have a weird obsession with Mormonism (Under the Banner of Heaven is one of my favorite books!) so I for one would love to experience the Mormon side of Utah. Some of the festivals sound like a trip! But I’m just weird like that…I’m so glad you guys gave Utah a shot in spite of the state’s Mormon influence. All of your posts have been incredible and have made me realize just how badly I need to take a serious road trip through the US. 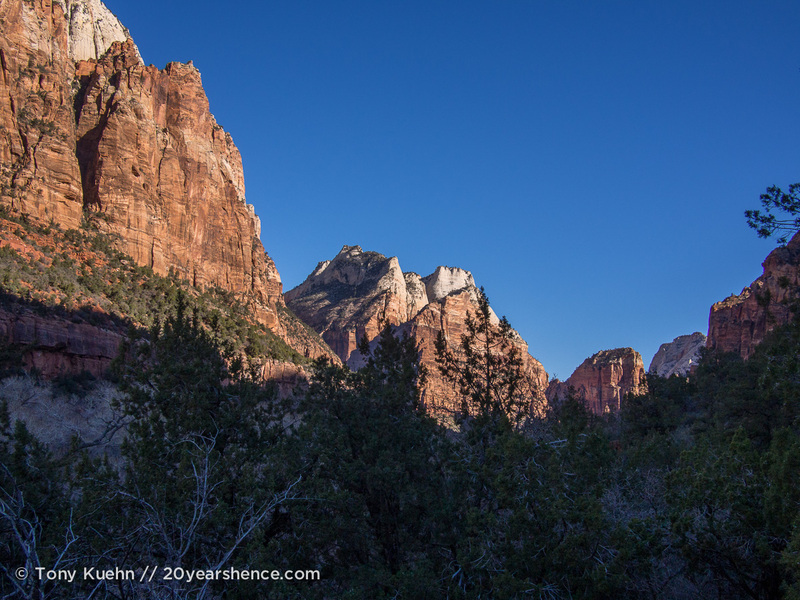 And Zion is really, really high on my list. It looks spectacular. Your photos are amazing but I imagine it’s stunning in person! Given your obsession with Mormonism, you REALLY do need to visit Utah (especially since your brother lives there!). I actually would have loved to have visited Salt Lake City and checked out their massive temple there, but it was definitely out our way and just didn’t make sense for this trip. One day! I first visited Utah a few years ago on a cross-country rock climbing trip (we’re from the atlantic coast of Canada). 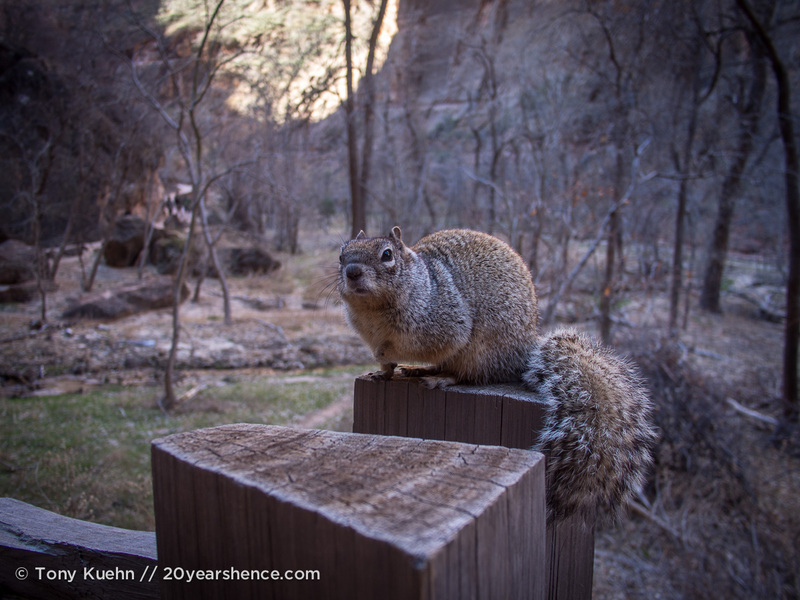 We spent four days at Indian Creek (near Moab) and I fell in love with the landscape. The colors, the skyline, the plants – it was unlike anything I’d ever seen before. Utah hadn’t been on my radar at all prior to this trip,but now I want to go back and explore the rest of the state. Yes, the colors and landscape of Utah (especially around Moab) are definitely unlike any I have ever seen before. I like to think that I’ve been to some really gorgeous places during our travels, and yet Utah handily leapfrogged to the front of the pack. I had never been very interested in visiting that part of the States, but now I definitely have more exploring there to do! it is interesting how often we “open-minded” folk are not so accepting of people who are less open-minded than ourselves (which of course raises the question, how open minded are we really?!?). It’s something I’ve admittedly been guilty of in the past, and it’s a humbling feeling to have our prejudices melt away as you’ve described. I’m glad you had a great time – Utah looks beautiful! You are absolutely right, Tim! I try really hard to be open-minded and keep a “live and let live” attitude, but traveling the world has definitely taught me that I have more work to do when it comes to examining deep-seated prejudices and really embracing all the diversity that exists on our planet. Utah was definitely a great place to have the scales fall from my eyes, that is for sure! Of all the places I’d love to go in the U.S, I’ve never considered Utah to be one of them but your photos look amazing. Coming from the UK, the sheer size of the U.S and the variation in landscape and culture blow my mind. We’ll have to tackle it one area at a time I think. During our travels, Tony & I definitely came to appreciate just how varied and diverse the United States really is. During my seven years living there, we traveled exclusively within the country and still there is so much that I’ve yet to see there. I know a lot of people give Americans short shrift for not traveling internationally, but the country really is HUGE and there is honestly so much incredible stuff to see there that I kind of don’t fault people who have limited their travels to domestic travel there. And definitely do the U.S. one section at a time. It’s really the only realistic/sensible way to tackle such a behemoth!